World War I Collector - WW1/WW2 Memorabilia Collection - Teehan, Francis J. This is one of the most fantastic Purple Hearts ever. 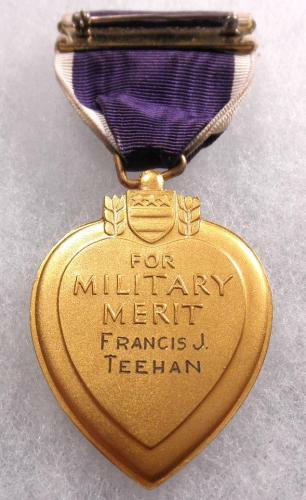 PFC Francis Teehan was the FIRST person killed in the 7th Bombardment Group in Burma, on June 2, 1942. At that time the 7th was stationed at the Dum Dum airport in India. The "7th Bombardment Group/Wing 1918-1995" by Robert Dorr, published by Turner Publishing in 1996 has a detailed account of Teehan's death, written by a fellow crewmember who was on Teehan's B-17. This can be found on page 125 of that book and is detailed below. PFC Teehan's group includes his officially engraved slot brooch posthumous Purple Heart and presentation box. The unit history mentioned above is included. 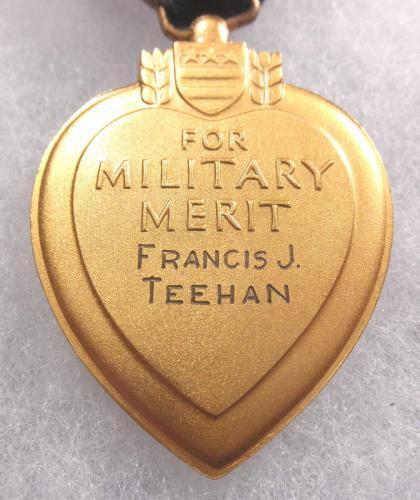 Francis Teehan was born June 12, 1921 in the area of Footville, Wisconsin. He enlisted in the Air Corps on December 27, 1939. He was killed in action June 2, 1942 in Burma. The National Archives data indicates June 2, whereas the statements in the unit history indicate June 3. This discrepency is unresolved. His remains were returned to the US in 1949, and he was buried in Calvary cemetary in Monroe, Wisconsin. The following is the excerpt from the above mentioned unit history: "On 3 June, three of the 436th (88th) B-17s flew from Allahabad, India to Dum Dum airport near Calcutta to stage out of there for a mission. The next morning one of the planes was not able to fly, however, aircraft flown by Sharp and Toomey went on to complete the mission. K.F. (Jack) Horner, Navigator on Capt. Frank D. Sharp's crew, recounts what happened. 'Two planes headed for Rangoon to bomb shipping in the Irrawaddy River. During the course of the bombing, we were attacked by a squadron of Zeros and other unidentified aircraft. When we reached cloud cover about 15 or 20 minutes later, we had shot down, by my count, over seven planes, although officially we were given credit for four. After entering the cloud cover, Sgt. Malok, the crew chief,entered the bomb bay to fight a fire. Some minutes thereafter the Bombardier, George Wilson, and I either misinterpreted the order to bail out or were given the order to bail out. Our electrical system was down and I was communicating with the pilot, Capt. Sharp, through the bulkhead separating the nose from the pilot compartment. I later found out that after we bailed out, Sgt. Malok emerged from the bomb bay and advised the pilot that he had extinguished the fire. They then began to throw everything movable off the plane to lighten the load. Eventually, after they had flown for nearly an hour, the plane was losing altitude so fast that the balance of the crew bailed out. The plane again began to maintain altitude and eventually reached the line between Japanese and Allied forces. Capt. Sharp crash landed the plane in a rice paddy. Of the balance of the crew, a young private, Francis J. Teehan, had been killed in the plane. Al Malok, Hal Cummings, Eli Gonsalves, and Smith Radcliff were reunited with George and myself about four months later in Rangoon prison. Malok, Cummings and Gonsalves were killed by Allied bombs on 29 November, 1943. Radcliff, Wilson, and I were returned to Allied control in May 1945. Sadly, Teehan, a gunner on Capt. Sharp's crew, was the first American from the 7th killed over Burma. Sharp and co-pilot 1st Lt. Herbert Wunderlich walked out after burying Teehan' "